U.S. Solar Market Insight® is a quarterly publication of GTM Research and the Solar Energy Industries Association (SEIA)®. Each quarter, we survey nearly 200 utilities, state agencies, installers, and manufacturers to collect granular data on the U.S. solar market. This data provides the backbone of this Solar Market Insight® report, in which we identify and analyze trends in U.S. solar demand, manufacturing, and pricing by state and market segment. We also use this analysis to look forward and forecast demand over the next five years. This is the 12th edition of the quarterly GTM Research/SEIA® U.S. Solar Market InsightTM series. 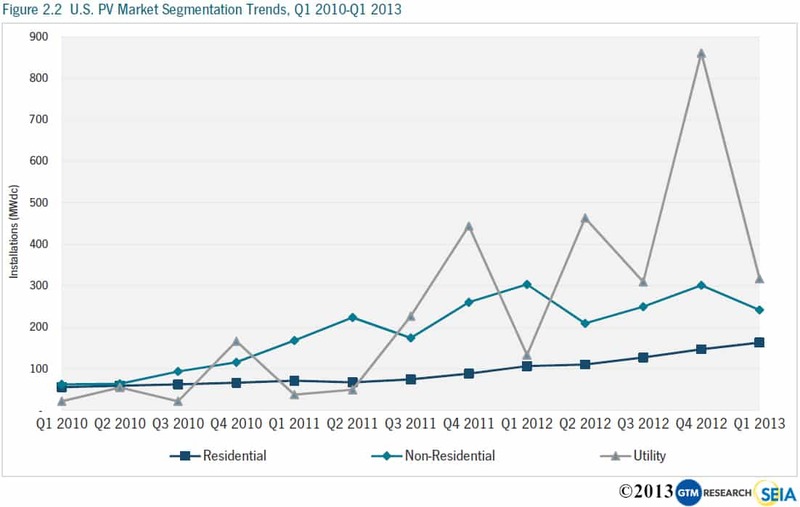 From the first report published in 2010 through the end of 2012, the most dramatic transformation in the U.S. solar market was the growth of utility-scale solar. 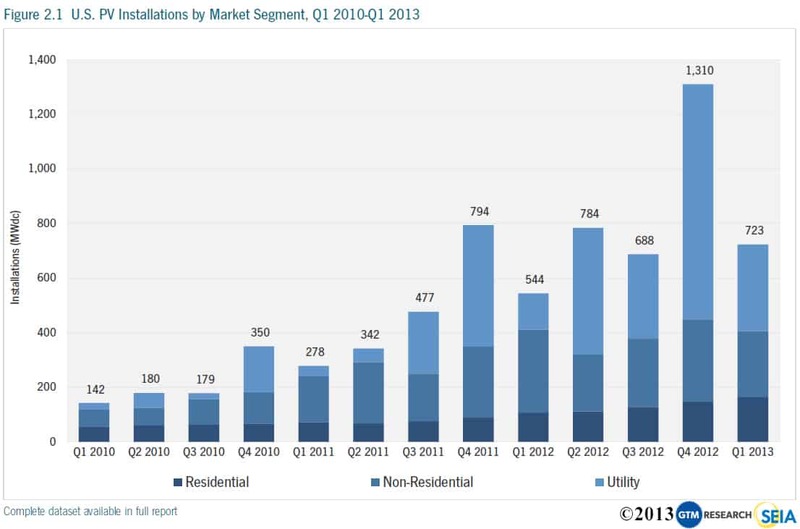 Utility PV installations in the U.S. grew 670% over the course of just two years from 2010 to 2012. In 2012 alone, 1,769 MW of utility PV was connected to the grid – 59% more than the cumulative total in all prior years. 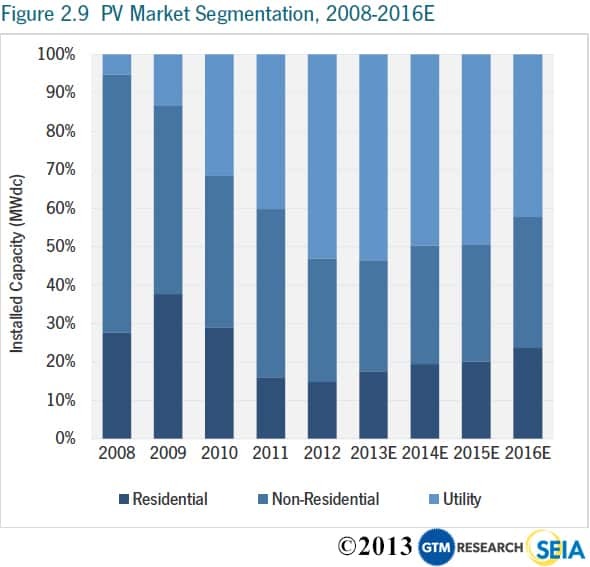 While residential and non-residential solar grew substantially during that period, the growth rate paled in comparison to that of the utility market. We expect that the next four years will be marked by a new solar revolution in the U.S., this time driven by the distributed generation (DG) market. Whereas residential and commercial solar markets have historically been effectively capped by the availability of state- and utility-level incentives, solar has now become cost-effective in some markets with only the federal investment tax credit (ITC), accelerated depreciation and net metering. 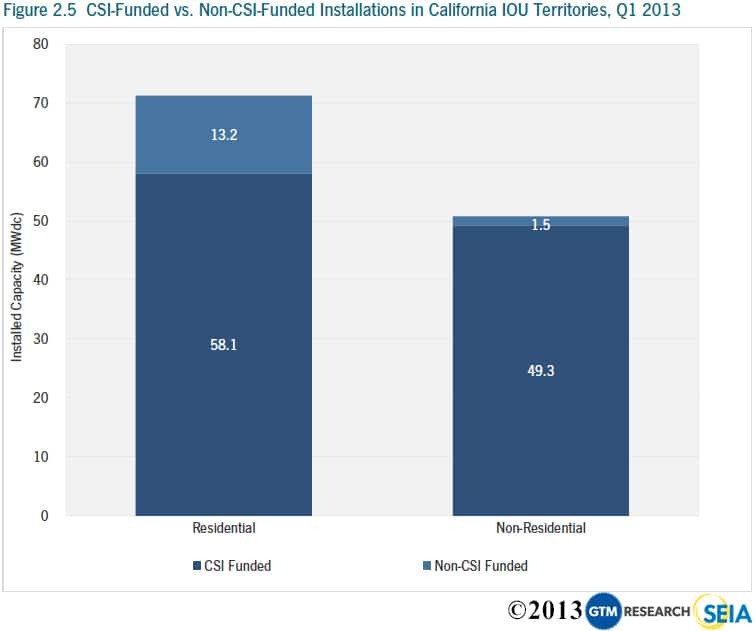 This report highlights this shift in California, where a meaningful number of installations have been completed without California Solar Initiative incentives, which have been that market’s main driver since 2007. Net metering and the debate over how to value distributed generation: As the penetration of DG has grown, a number of utilities have sought to revise, cap, or remove net metering. This issue will play out differently across geographies but will have major implications everywhere. Changing rate structures: Utility tariff structures can similarly impact the cost-effectiveness of solar. Changes in the details of these structures (such as how to incorporate time-of-use pricing and fixed vs. volumetric charges) can easily push solar into, or out of, economic viability. While net metering is currently a more public battleground, we anticipate that rate structures will soon follow behind. The availability and cost of project finance: We estimate that the distributed generation market will require $48.5 billion of investment during the 2013-2017 period, which far exceeds all project finance provided to date. Market participants and advocates are working to secure new sources of capital, adapting financing models from other industries (REITs, master limited partnerships), retail capital sources (crowdfunding, community solar), and new investors in existing structures (corporate and utility tax equity). Still, project finance could serve as a significant bottleneck to growth over the next four years. 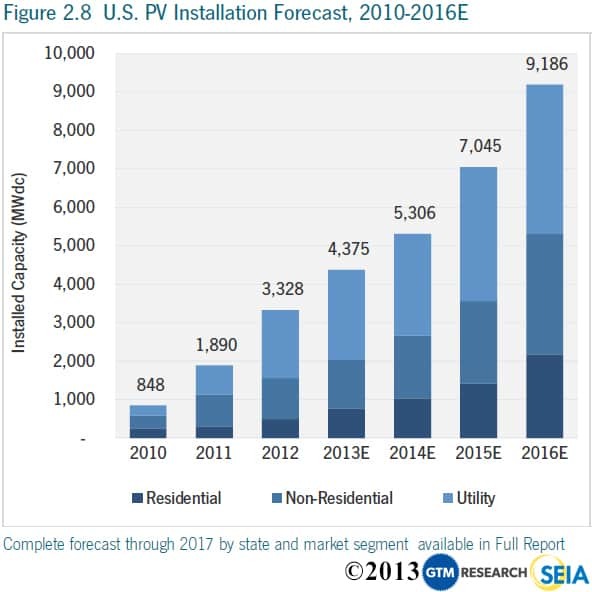 In the absence of these limiting factors, residential and commercial PV could grow exponentially through 2016. This quarter we have added coverage on three new states: Minnesota, New Hampshire and Utah. This brings our total coverage to 28 states and Washington, D.C. 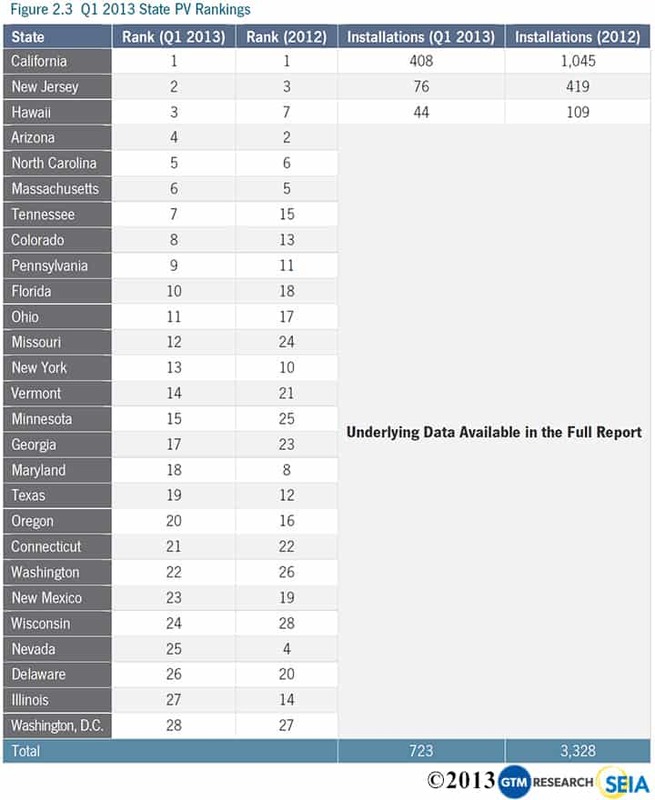 However, the national totals reported include all 50 states, Washington, D.C., and Puerto Rico. The U.S. installed 723 MW of PV in Q1 2013. This represents a 45% decline from Q4 2012, but 33% growth over Q1 2012. As always, it is important to take the utility market out of the equation when seeking meaningful conclusions from the comparison of quarterly installation figures; the utility market is simply too volatile and dependent on individual project timelines. In that context, Q1 was quite strong in the residential market (53% year-over-year growth) and weak in the non-residential market (down 20% year-over-year). This reflects our general outlook for the year; we expect significantly stronger growth in the residential market than the non-residential market. Utility installations were down substantially from Q4 2012, but up more than 130% relative to Q1 2012. This market generally experiences a boom in the fourth quarter and we expect the same pattern to hold in 2013. As has been the trend for years, the residential market continued its steady, incremental quarterly growth, and has not shown seasonality and market volatility on a national basis. Quarterly growth in the residential market has ranged from 4% to 21% in 12 of the past 13 quarters, and Q1 2013 sat in the middle of that range. While Hawaii’s growth percentage-wise seems small compared to the other leading states, Q1 2013 residential installs follow 70% market expansion in Q4 2012. The only top-tier residential market to shrink Q/Q was Arizona, which fell 9% in Q1 2013. The non-residential market had a slow start in 2013, down 20% on both a quarterly and annual basis. Most state markets shrank Q/Q, including California (46%), Arizona (77%), Hawaii (14%), and Massachusetts (43%). 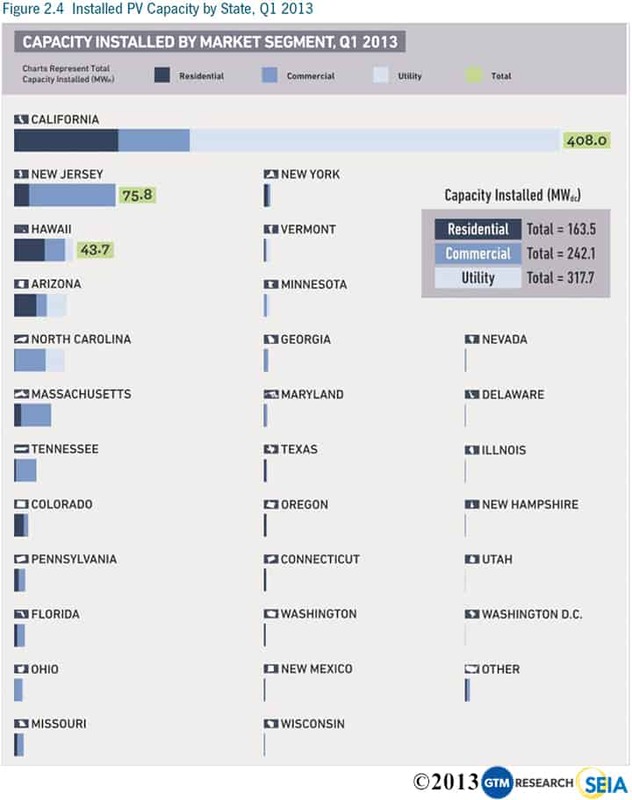 The only major state market to grow on a quarterly basis was New Jersey, which installed 65 MW in Q1, up 50% over Q4 2012. While we do expect the non-residential market to grow in 2013 overall, the growth rate should be significantly slower than in previous years. The non-residential market has been hit hardest with the general decrease in state-level incentives and will take more time to adjust than will the residential market. However, we do anticipate a turnaround and expect to see larger growth in states such as California and New York in the second half of the year. There were twenty-four utility projects completed in Q1 2013, ranging in size from 1 MW to 79 MW. Four of the five largest projects were the early phases of larger projects to be completed over the next two years. The five largest projects were commissioned in California, but utility projects were also installed in Arizona, North Carolina, Hawaii, Vermont, Minnesota, New Jersey and Ohio. Meanwhile, the pipeline of utility projects with power purchase agreements (PPAs) signed but which are not yet in operation rose to 10.7 GW, of which 3.9 GW are already in construction. A growing trend in California is for installers to forgo the California Solar Initiative (CSI) rebate for both residential and, in some cases, non-residential projects in the three investor-owned utility (IOU) territories. Now, with residential CSI rebates exhausted in Pacific Gas & Electric and San Diego Gas & Electric service territories, installers are increasingly installing systems without applying for the CSI rebate. After incorporating the 30% ITC, installers report that these systems have achieved “retail rate parity.” For non-residential systems, there is still ample capacity left under the various rebate schemes, and for larger systems, financials are significantly affected by not taking the $0.025/kWh (commercial) or $0.088/kWh (government/non-profit) performance-based incentives. In Southern California Edison and San Diego Gas & Electric territories, these rates are slightly higher. Still, in the residential market in particular, this shows that installation growth can be sustained even in the absence of state-level incentives. Furthermore, it demonstrates the impact that soft costs can have on PV project economics. Some companies forgo the rebate, even if available, to avoid time-consuming application processes. Q1 2013 saw a continuation of average installed price declines across all types of installations in the U.S.
From Q1 2012 to Q1 2013, residential system prices fell 15.8% percent, from $5.86/W to $4.93/W. Quarter-over-quarter, installed prices declined by 1.9% percent. Installed prices came down in most major residential markets, including California, Arizona, and New Jersey. It was not uncommon for final installed prices to be in the $4.00/W range. Non-residential system prices fell 15.6% percent year-over-year, from $4.64/W to $3.92/W, while installed prices decreased by 8.1% quarter-over-quarter. Significant quarter-over-quarter price declines came in smaller state markets with relatively high installation prices in Q4 2012. Most notably, Texas dropped from $6.36/W to $3.23/W during that period, while major market states like New Jersey and Massachusetts saw their installed prices stay flat. 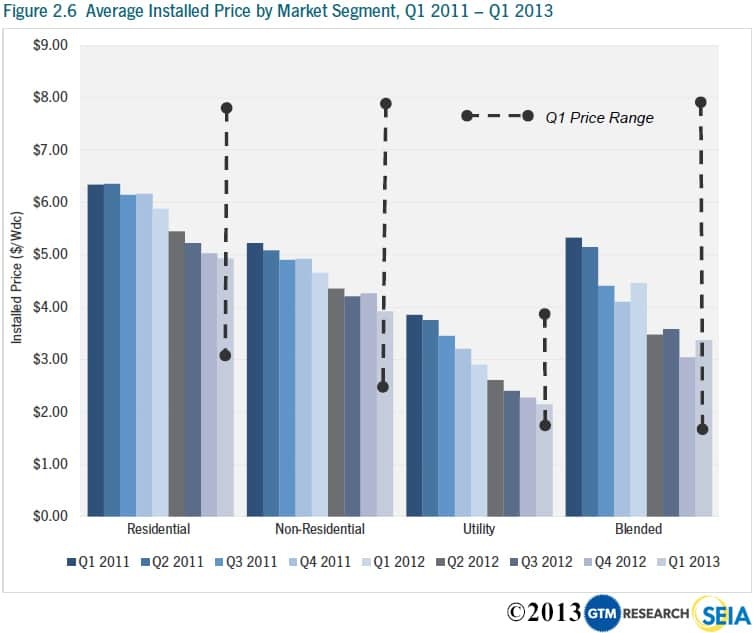 Utility system prices once again declined quarter-over-quarter and year-over-year, down from $2.90/W in Q1 2012 and $2.27/W in Q4 2012 to settle at $2.14/W in Q1 2013. This relatively small price decline is linked to the disproportionate number of smaller projects coming on-line in Q1 2013 than in Q4 2012. Pricing for polysilicon and PV components remained soft in Q1 2013 due to the persistence of the global oversupply environment that the industry has faced since early 2011. 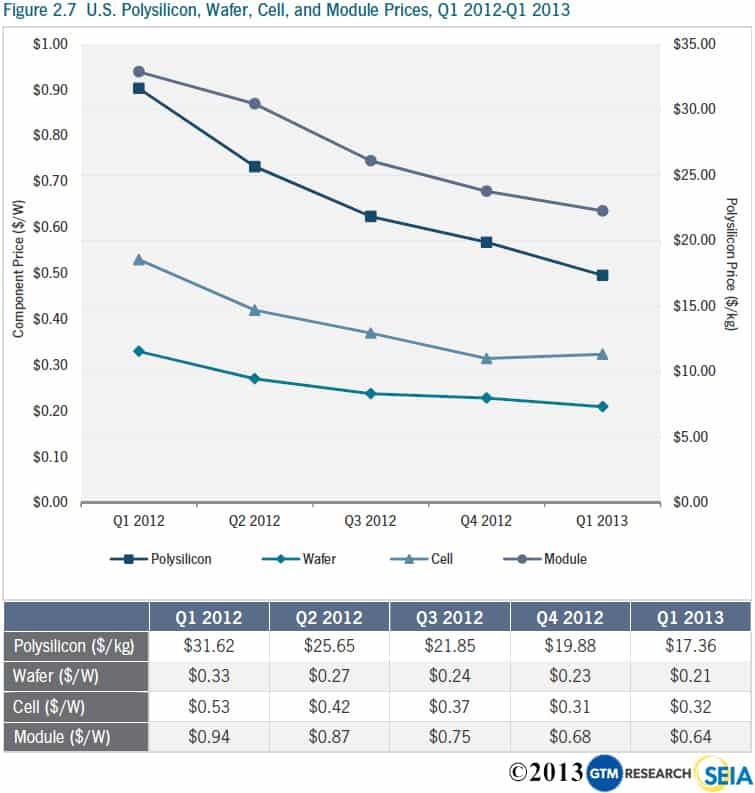 Blended polysilicon prices declined by 13% to $17/kg, while blended module average selling prices (ASPs) for Q1 2013 were down to $0.64/W, 6% below Q4 2012 levels of $0.68/W. Cells were the sole component to experience a pricing uptick in the first quarter, but as global component supply and demand begin to come back into balance, the steady downward pricing trend of the past few years could slow or stop in coming quarters. Our overall forecast for U.S. PV market has largely remained steady this quarter, with 4.4 GW expected to be installed in 2013, growing to nearly 9.2 GW annually in 2016. We have increased each year’s forecast marginally, due largely to increasingly bullish expectations for the residential market, where we see the most near-term opportunity for growth. 2013 should be a difficult year overall in the commercial market. We forecast 18% growth in that segment, down from 29% in 2012. However, we expect a resumption of stronger growth in 2014, continuing through 2016. Meanwhile, 2013 will be another record year in the utility market with 2.3 GW installed, but we expect a relatively flat year in 2014. In the Full Report, we also provide our first forecast for installations in 2017. This is a particularly important, and difficult, year to forecast because it would mark the year in which the Investment Tax Credit (ITC) reverts to 10% for commercial and third-party-owned systems and drops to zero for directly owned residential systems, unless the credit is renewed or extended before then. Our forecast assumes no extension in order to determine the impact that this would have on the market in 2017; the forecast methodology is described in detail in the full report. The comprehensive state and market-segment-specific 2017 forecast is only available in the Full Report. In addition to presenting anticipated installation figures, the analysis covers the impacts of the December 31, 2016 ITC program changes and how these will affect individual state markets. BrightSource’s Ivanpah project is on track to be completed in 2013, with all units now over 85% complete. The molten salt receiver panels were assembled at SolarReserve’s Crescent Dunes Solar Energy project. Pacific Gas & Electric received PPA approval from the California Public Utilities Commission to purchase power from the Rice Solar Energy project. BrightSource Energy and Abengoa Solar signed a partnership for the construction and operation of the Palen Solar project.